Amazing Kickboxing North York Classes That is One of Uptown Toronto’s Best Kept Secrets to Getting in Awesome Shape. Crazy Fast! It’s not only an exciting calorie-burning workout… but an all-out assault on stubborn body fat. Let’s face it. It’s hard to keep motivated to get in great shape when your workout is boring and repetitive. So, we’ve committed our efforts in making our Kickboxing North York classes fun, functional, and fresh each time you attend. You’ll enjoy a total body workout; incorporating sculpting exercises and conditioning methods designed to transform your body. Classes are high energy and fun, the workout is amazing, and everyone is very supportive and welcoming. Add all that to working with heavy bags, with real boxing gloves, and you’re in for the most exciting calorie burning 60 minutes of your time. Also, you won’t have to worry about fighting or getting hit. Our focus is on the calorie burning benefits of kickboxing. Truth is, the only feeling of “getting hit” you’ll notice is the calories you’re burning off every class. We focus on one thing above anything else – getting you in AMAZING shape! Call us now to schedule a drop-in class; or enter your information below to test-drive our classes with our awesome 3-Week trial offer. Give yourself a head-start in discovering why we are one of Toronto’s best kept secrets to getting in amazing shape… you’ll love what we do! North York Kickboxing Classes that are intense, exciting, will make you sweat, and get you in amazing shape. T.H.A Martial Arts & Kickboxing classes in North York Toronto are carefully designed to be functional, result-driven, beginner friendly, and tons of fun. We also have the friendliest, kindest, most knowledgeable and caring kickboxing instructors you’ll ever encounter. And trust us on this… nothing relieves stress better than hitting a punching bag! From our pro-grade equipment, to the design of our facility – everything is geared towards keeping you safe, comfortable, and inspired. 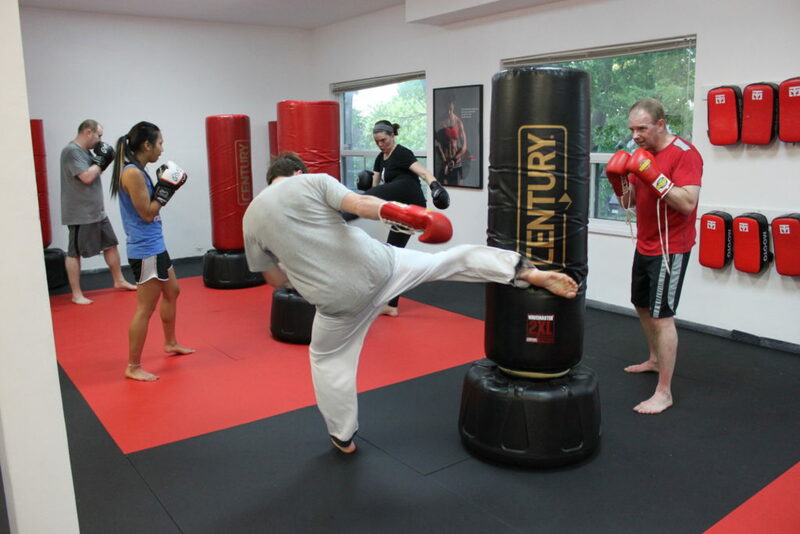 Our goal is to make your experience in our North York Kickboxing classes as fun and fulfilling as possible. Bring your sweat rag – you’re going to need it! Martial arts offers amazing life changing benefits, and more than just self protection or amazing fitness – it is a path of self-discovery – and we would love an opportunity to share some of those benefits with you.